Week two of the SCS.com Hoops Preview series concludes with a look at two major of the country's major conferences. This year, expect to see a few new faces near the top of the Big Ten standings once conference play rolls around, as Wisconsin, Ohio State, and Michigan should all be contenders. In the Big East, Pittsburgh and Georgetown look to have what it takes to finish near the top, as do Syracuse, Connecticut, and Marquette. Will these squads live up to their potential this season or find themselves on the NCAA Tournament bubble come March? Wisconsin- While Ohio State and their highly-touted group of freshmen are getting most of the hype coming out of the Big Ten, Wisconsin should be the team to beat. The Badgers return four starters, get two players back that only played half of the team's games last year, and also bring in a solid recruiting class. However, any talk about Wisconsin has to start with All-America Alando Tucker. Tucker is one of the best scoring forwards in the country and could be the most versatile scorer in all of college basketball. He's not an outstanding shooter but he has excellent body control and creates mismatches with his size and scoring ability. Look for him to have an even better season than last year. Joining Tucker up front will be former McDonald's All-America Brian Butch. He has yet to live up to the hype he had coming out of high school, but he is a solid post player that developed as the season went on a year ago. Look for him to improve his numbers this season. Rounding out the frontcourt will likely be Jason Chappell. The returning starter is a good role player who provides good rebounding and defense. Off the bench will be Marcus Landry and Greg Stiemsma, who both did not play after the half-way mark of last season. Landry was suspended due to academics, but he could player a major role this year. He had shown flashes of excellence before his suspension, and could breakout this season. 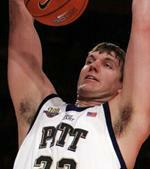 Stiemsma left due to personal problems, but he is a quality rebounder and a very good shot-blocker. Joe Krabbenhoft is a very good shooter on the wing. He is also a solid rebounder and passer. In the backcourt, Kammron Taylor leads the way. He is not a natural point guard but he plays that position for the Badgers. Taylor is a very good scorer and one of the team's best three-point shooters. He is also a decent defender and a good passer. His backcourt partner is Michael Flowers. The 6-2 junior played well down the stretch last season, and could carry that over to this season. He is a very good three-point shooter who is also a solid defender. Freshmen Jason Bohannon and Trevon Hughes will provide depth. Bohannon could be a big-time scorer for the Badgers. While the preseason publications and rankings are touting the Buckeyes as a Final Four contender, I don't think they are more than a Sweet Sixteen team at this point. However, once the young players develop, look out. The big man on campus is obviously Greg Oden. The 7-1 freshman has been mentioned in the same breath as Hall of Famers Patrick Ewing, Lew Alcindor, Hakeem Olajuwon, among others. He is expected to immediately dominate the college game. However, he injured his wrist in February and is not likely to play until January. His high school teammate, Mike Conley, also joins the Buckeyes. The 6-1 point guard could start immediately. He is a very good ball-handler and passer. Another McDonald's All-American, Daequan Cook, could make the biggest impact of any of the freshmen. The 6-5 wing is very athletic and is an outstanding scorer. He might have to be the go-to-guy in Oden's absence. Wing David Lighty is another impact freshman. He has a nice inside-outside offensive game. JC transfer Othello Hunter could start right away in the paint with Oden out. He is a very good all-around game and can excel at both ends of the floor. As for the returnees, the backcourt of Jamar Butler and Ron Lewis leads the way. Butler is one of the best point guards in the country and will have to step up his offense this season. He is an excellent distributor who was also a double-figure scorer last season. Moreover, he is a very good three-point shooter and a solid rebounder and defender. Lewis is a pure scorer that will step into the starting lineup after coming off the bench last season. He is a very good all-around point producer who can shoot from the outside as well as drive to the basket. Frontcourt role players Ivan Harris and Matt Terwilliger will have to play extended minutes with Oden out, but they don't do more than provide adequate production down low. Michigan- Is this the year that the Wolverines finally live up to expectations and make the NCAA Tournament? With the return of three starters from a team that made it to the NIT Championship, it looks like it could be. Although one of the starters lost is first-team All-Big Ten guard Daniel Horton, coach Tommy Amaker should be able to get this group to the Big Dance. Dion Harris leads the way. The 6-3 guard will move from the two to the point guard position this season with the loss of Horton. Harris is an excellent three-point shooter and a good scorer and rebounder. He played the point two seasons ago, and should be able to handle it this season. Lester Abram and Ron Coleman will likely start on the wings. Abram has missed the better part of two sason due to injuries, but he is an explosive double-digit scorer when healthy. Coleman was a part-time starter last season. He is an athletic, versatile swingman who can score and rebound well. Sophomores Jeret Smith and Jevohn Shepherd will provide depth. Smith can play the point if Harris can't handle it, while Shepherd is a good contributor. Up front, center Courtney Sims needs to play to his potential. He has the ability to dominate the interior, but has only done it in flashes. He has a variety of post moves and is also a decent rebounder and a very good shot-blocker. He could have a big season. Senior Brent Petway is very athletic and has a non-stop motor on the court. He can rebound and block shots. Off the bench, freshmen Kendric Price and DaShawn Sims will play. Price is a good all-around player, while Sims is an impact freshman. Illinois- The Fighting Illini are an interesting team to analyze heading into the season. Some could overrate them based on their success over the last several years, while others could underrate them as a result of the losses of Dee Brown and James Augustine. Even without those two, though, Illinois still returns ten players from last season. The backcourt will have to replace Brown at the point, but there are two viable options for that position. Chester Frazier saw minutes behind Brown last season, and demonstrated his ability to take care of the ball and be a ballhawk on defense. He is very quick who needs to control the tempo better if he is to start. Dayton transfer Trent Meachem is the other option. He is an outstanding three-point shooter who is also a solid distributor. The wing will feature two excellent long-range gunners. Senior Rich McBride played down the stretch and will develop into one of the go-to-guys this season. Jamar Smith started out hot last season, but cooled down as the year went on. The sophomore is still a prolific shooter. The frontcourt should be solid as well. Brian Randle could become the team's leader. He is an efficient shooter from the floor who does a little bit of everything at both ends of the court. He is a decent scorer and rebounder who is one of the best defensive players in the conference. Shaun Pruitt is a beast in the paint. He made the most of his minutes last season and could become a go-to-player down low. He is extremely efficient shooting the ball. Marcus Arnold is a solid role player who will provide depth. Warren Carter could have a big year. He creates matchup problems with his athleticism and 6-9 size. He can play both forward spots and will see plenty of minutes. Indiana- The Hoosiers come into the season as a team that could finish as high as third in the conference, or as low as eighth. That is because they lose three starters, including Marco Killingsworth and Robert Vaden. However, new coach Kelvin Sampson has plenty of weapons to work with. The go-to-guy will be D.J. White. He only played in five games last season, but should be healthy and ready to play this year. He is a very good interior scorer and a solid rebounder who is one of the best shot-blockers in the conference. He could be one of the best big men in the country this season. Joining him up front will be returnee Ben Allen and JC transfers Mike White and Lance Stemler. Allen is a good long-range shooter, while White and Stemler were JC All-Americans who will make an immediate impact in the frontcourt. The backcourt has several returnees that will fight over minutes. Point guard Earl Calloway played well in the NCAA Tournament, and could develop into a very good player this season. Junior A.J. Ratliff is a good shooter who plays solid defense, while Roderick Wilmont could become an all-conference player this season. He is an excellent defender and athlete who can score and rebound very well. Senior Errek Suhr and freshman Joey Shaw are excellent shooters from the perimeter. Michigan State- This might be the only year you will see the Spartans this low in the preseason, so take notice while you can. MSU loses four starters from last season, including NBA Draft picks Shannon Brown, Maurice Ager, and Paul Davis. However, Tom Izzo has some quality players returning and he also brings in a couple of impact freshmen. Drew Neitzel will have to become the go-to-guy for the Spartans. He has played point guard his entire career, but will need to score more this season if MSU is going to win games. He takes excellent care of the ball and is a very good passer. Moreover, he can shoot the three with efficiency. If he moves to the two, sophomore Travis Walton could run the point. He is a stout defender who is a solid passer and ball-handler. Freshman Isaiah Dahlman and sophomore Maurice Joseph will provide extensive minutes off the bench with the lack of depth MSU will have this season. Dahlman could make an immediate impact. Raymar Morgan will step in on the wing. The 6-7 freshman is a big-time scorer who can also rebound very well. Up front, part-time starter Marquise Gray returns. He is very athletic and is a good rebounder who will need to live up to his potential in order for the Spartans to compete. Centers Drew Naymick and Goran Suton were solid role players throughout their careers, but they will need to provide better rebounding and defense for the Spartans. Suton could be a surprise player this season if his scoring numbers improve. I pegged Purdue as a sleeper heading into last season, and I did the same again this season. However, once again, unexpected losses could hinder the team. Last year, the outstanding inside-outside duo of guard David Teague and Carl Landry were both lost due to torn ACLs, while point guard Tarrance Crump was suspended and freshman Nate Minnoy was injured halfway through the season. Moreover, Geno Parker and Marcus White were hampered throughout the season, and Korey Spates was kicked off the team. This year, nearly every contributor from last season returns, aside from Minnoy, who left the team before the season due to personal reasons. Landry, finally healthy, could return to his dominant form. He is an excellent scorer and a good rebounder who is one of the best post players in the country. Teague is a very good scorer and defender who can shoot the ball efficiently from deep. Crump will also be welcomed back into the fold. He is an explosive playmaker who can distribute and score at the point. Sophomore Chris Lutz is an excellent shooter who can move over to his natural shooting-guard spot this season with Crump taking over the lead guard position. Guard Marcus Green is another solid performer on the perimeter. Joining Landry up front could be Boston College transfer Gordon Watt. He is a good role player who needs to improve his production. Penn State- This could be Penn State's best season in a long time. After several seasons of single-digit wins, the Nittany Lions finished .500 last year, and will likely do better this season. Most of the optimism centers around the forward tandem of Geary Claxton and Jamelle Cornley. Claxton, a 6-5 swingman, is one of the most underrated players in the country. He is an excellent all-around player who could become a first-team all-conference selection this season. He is a very good scorer and one of the best offensive rebounders in the nation. He can also block shots. Cornley was the Big Ten Freshman of the Year last season after posting very impressive numbers during his first year. He could be even better this year. Down low, part-time starter Brandon Hassell and sophomore Milos Bogetic will fight for minutes. Hassell might be the better candidate, but Bogetic is a solid scorer and rebounder. On the perimeter, starters Ben Luber and David Jackson return. Luber is a very good distributor and an outstanding three-point shooter who also takes care of the ball. Jackson contributes in a variety of ways and is a very important part for PSU. Sixth man Mike Walker also returns. He is a good scorer and distributor. Sophomore Danny Morrisey, who sat out lat season with an injury, also returns. Iowa- After back-to-back seasons of at least 21 wins, the Hawkeyes will come into this season without three starters from a year ago, including Jeff Horner and Greg Brunner. As a result, they are being somewhat overlooked heading into the season. While I also think they will finish in the bottom half of the Big Ten, I think they could be a sleeper and be competitive every night. Adam Haluska is an excellent all-around scorer who could be poised for a huge year this season. He will be the go-to-guy this year because of the losses, and he could develop into one of the best players in the Big Ten. He is also a solid rebounder and passer. Mike Henderson and Tony Freeman also return on the perimeter. Henderson is an outstanding defender who is also one of the best three-point shooters in the conference, percentage-wise. Look for him to take the next step and become a double-figure scorer this season. Freeman will step in at the point. He is a very good defender and ball-handler who developed as the season went on. Freshman Tyler Smith is expected to have an immediate impact at the forward spot. He is an inside-outside scorer who will likely be one of the top two scoring options for the Hawkeyes. JC transfer Justin Johnson will help off the bench. Up front, JC transfer Cyrus Tate will start right away. He is an outstanding rebounder who will one of the top optins down low. Junior centers Kurt Looby and Seth Gorney will also fight for a starting job. Minnesota- With the loss of five starters from last season, this could be the final season for Dan Monson with the Golden Gophers. Although he has a winning record with the club, he is seemingly always on the hot seat, and with a lack of proven players this year, it will be a tough go for him. The team's strength will be in the frontcourt. Returnees Spencer Tollackson and Dan Coleman had solid seasons a year ago, but will need to develop into go-to-guys this season. Tollackson is very efficient shooting the ball and is a solid scorer and rebounder, while Coleman is an inside-outside player who could be poised for a big season in the frontcourt. Also returning up front is sophomore Jonathan Williams, who will provide minutes down low. JC transfer Engen Nurumb could be a productive scorer and rebounder. Wings Jamal Abu-Shamala and Brandon Smith played well down the stretch last season. Abu-Shamala is a very good shooter, while Smith is a versatile defender who will fight for a starting job. Oklahoma transfer Lawrence McKenzie will start on the perimeter. He is an outstanding three-point shooter who can handle the ball and distribute if needed. JC transfer Limar Wilson will also fight for a starting job in the backcourt. Northwestern- The Wildcats have improved the last couple of season, finishing only one game below .500 last season, but they lose the Big Ten's leading scorer Vedran Vukusic, as well as Mohamed Hachad. They don't return anyone that averaged over 8 points per game last season. Tim Doyle is the team's leading returning scorer, rebounder, and assist man. The 6-5 wing is a solid all-around player who needs to increase his scoring this season for the Wildcats. He is extremely versatile. Joining him on the wing will be Craig Moore, who is a very good three-point shooter and could become a go-to-guy this season. Sterling Williams played well throughout last season, but saw decreased playing time down the stretch. Freshmen Jeff Ryan, a 6-8 wing, and Jeremy Nah, a top-rated point guard, will fight for starting jobs on the perimeter. Up front, Ivan Tolic and Vince Scott will be the main returnees. Scott could develop into a serviceable player down low if he improves as expected. Freshman Kevin Coble should make an impact in the frontcourt as well. Pittsburgh- The Panthers come into the season as the favorite to win the conference. They are coming off of a 25-win season, but only advanced to the second round before being upset by Bradley. Pitt should make it past the Round of 32 this season. They need to replace the heart-and-soul of last year's team in Carl Krauser, but the Panthers are deep and talented and should be fine. It all starts with All-America candidate Aaron Gray. The 7-foot center is one of the best big men in the country and could have an even better season this year after averaging a double-double a season ago. He is an excellent rebounder and efficient scorer who is a solid passer and shooter. Joining him in the frontcourt will be forwards Levon Kendall and Sam Young, who will split time at the power forward position. Kendall is an inside-outside scorer who can do a little bit of everything on the court. He can score, rebound, and play solid defense. Young has a lot of potential. He is extremely athletic and is a good scorer. He is a potential match-up problem up front. Sophomore Tyrell Biggs will provide depth down low. The perimeter group is deep and versatile. Levance Fields and Ronald Ramon will start in the backcourt. Fields is a crafty scorer who is shifty when driving to the basket and can also shoot the three. He is a very good passer and takes care of the ball. Ramon is an excellent three-point shooter who is a solid guard. He doesn't make mistakes and is a good ball-handler and passer. On the wing will likely be East Carolina transfer Mike Cook. He is a very good scorer who is tough to stop when driving to the basket. He is also a decent defender and rebounder. Senior Antonio Graves is a good defender and a decent scorer who was a former starter in the backcourt. Keith Benjamin is athletic and is a good three-point shooter, while freshman Gilbert Brown will make an immediate impact on the wing. He has a nice mid-range game and is very athletic. Georgetown- The only other team getting love in the preseason Top-10 polls out of the Big East is Georgetown. The Hoyas had a strong finish to last season and reached the Sweet Sixteen in the NCAA Tournament before falling late to eventual champion Florida. They are led by one of the best frontcourts in the country. All-America candidate Jeff Green will be the go-to-guy. He is one of the best all-around players in the country and creates match-up problems with nearly every defender due to his versatility and size. He can shoot the three, post up, defend multiple positions, distribute the ball, and rebound very well. Center Roy Hibbert is one of the ten best players at his position in the country. He had loads of potential, and looks to have a breakout season this year. The 7-2 junior is a big-time rebounder and shot-blocker who has a developing offensive game. Indiana transfer Patrick Ewing and highly-touted freshmen Vernon Macklin and DaJuan Summers will fight for the remaining starting spot. Ewing is a decent scorer and rebounder who has a non-stop motor. Macklin was a McDonald's All-American and is an outstanding rebounder who will make an immediate impact up front. Summers is versatile and can play either forward position. The backcourt is not as loaded. Point guard Jonathan Wallace returns as the starter, but will need to improve his offensive game with the loss of several perimeter scorers. He is a very good distributor who takes excellent care of the ball. He is also a good three-point shooter and defender. The wing scoring will come from returnees Jessie Sapp and Tyler Crawford, and freshman Jeremiah Rivers. Sapp is a good point producer who is also a surprisingly solid rebounder, while Crawford is a good shooter. Rivers is a combo guard who can pass and score. Syracuse- With the loss of Gerry McNamara, who was one of the most popular players in the history of Syracuse basketball, is it possible that the Orange will be better? The answer is yes. They were only 7-9 in the Big East last season, but return four starters and bring in one of the best freshman in the country. That freshman is Paul Harris. One of the top-rated players coming into college, Harris can play any position on the perimeter. He is an outstanding defender and a good rebounder who could start right away. Harris is also a solid shooter and passer. His partner in the backcourt will be sophomore Eric Devendorf. The 6-4 combo guard is a very talented, albeit hot-headed, player who could improve immensely if he keeps his focus. He is a good three-point shooter who also a solid ball-handler and passer. Look for him to be the go-to-guy this season. Junior Josh Wright will see minutes at both guard spots, especially at the point. He is a good scorer and passer who takes care of the ball. The frontcourt will be made up of three seniors who have not yet lived to the expectations they came into school with. Demetris Nichols leads the way. He is a very good three-point shooter who can also rebound and play defense well. 6-9 Terrence Roberts could have a break-out year. However, many have been saying that for the past two years. He is very athletic and is an excellent shot-blocker and rebounder. Roberts is also a decent scorer in the paint who needs to improve his free-throw shooting. Darryl Watkins is a potential force on the defensive end. He is one of the best shot-blockers in the country and is a very good rebounder. If he improves his low-post scoring, the Orange will be tough down low. Freshman Mike Jones is a very good all-around player who can score on the wing, while 6-9 senior Matt Gorman provides depth down low. Connecticut- The Huskies had the most talent in the country last season, but fell short of the Final Four after a last-second overtime loss to George Mason in the Elite Eight. However, they lose all five starters and their sixth man from that team, leaving Jim Calhoun with plenty of questions heading into the season. On the other hand, though, the Huskies bring in one of the top recruiting classes in the country. One player from that class is guaranteed to start. 7-3 center Haseem Thabeet could be a lottery pick after he leaves UConn. He is an outstanding shot-blocker who will make an immediate impact with his defensive prowess. Thabeet is also an impressive athlete who can rebound and score. Another big man, Curtis Kelly, will see time down low. He is tough to stop on the low block and has a variety of post moves. Yet another highly-touted frontcourt player, Stanley Robinson, could make the biggest impact of anyone. He can do nearly everything on the court and will be one of the team's best scorers. He is a good shooter and can also drive to the basket. Post players Gavin Edwards and Jonathan Mandelove will also get playing time in the post. The freshmen in the backcourt that are expected to fight for starting jobs are Doug Wiggins and Jerome Dyson. Wiggins is a quick point guard who can score and distribue very well. Dyson may be the go-to-guy on the perimeter. He is an excellent three-point shooter who also uses his athleticism to get to the basket past most defenders. There is one more newcomer who will make a huge impact. A.J. Price is entering his third season in the program, but has not yet played for Huskies. He was medically redshirted for a season and was suspended last year in the infamous laptop incident. However, he is eligible this season and ready to play. He is very athletic and can fill it up. He will start at the point. The main returnee is Jeff Adrien, a potential break-out candidate. He is a brusier on the interior who is a relentless rebounder and a good athlete who can block shots. Guards Craig Austrie and Robert Garrison saw extensive playing time at the point last season when Marcus Williams was suspended, while wing Marcus Johnson is a big-time athlete who can score. Marquette- The Golden Eagles had another solid season last year, winning 20 games and advancing to the NCAA Tournament. With one of the nation's best backcourts returning, Tom Crean and Marquette could do even better this season. All-America Dominic James is one of the top point guards in the country and can be a dominant peformer due to his all-around ability and athleticism. He is strong in traffic once he gets past defenders using his quickness. The Big East Rookie of the Year last season will carry the Golden Eagles this season. Jerel McNeal is an excellent defender and is also solid on the offensive end. If he cuts down on his turnovers, he could have a breakout season. Wesley Matthews has a very good all-around game. He can score, rebound, defend, and shoot the ball. He is an underrated performer on a national level. Newcomer David Cubillan will give James temporary breathers. The frontcourt needs to replace two starters, including All-Big East performer Steve Novak. Dan Fitzgerald is the main candidate to fill his shoes. He is extremely versatile and can play nearly any position on the court. The 6-9 junior can shoot the ball efficiently and is a match-up problem for most opponents. He needs to improve his rebounding and post defense, though. Lazar Hayward is another versatile forward who can play multiple positions. He will fight for a starting job. Junior Ousmane Barro will start in the low post. He is a good scorer and rebounder who is athletic. Mike Kinsella and Jamil Lott will see minutes up front. Louisville- The Cardinals were a major disappointment last season, going from a Final Four appearance to an NIT berth--albeit an NIT Final Four appearance. However, they were expected to be in the four-letter tournament, but Rick Pitino has the talent and depth to be a legitimate Sweet Sixteen contender this season. How well they do depends on their health, though. Center David Padgett is a very good inside-outside player who has the ability to be one of the better big men in the Big East. He is an efficient scorer who is also a good shot-blocker and rebounder. However, he will not play until January due to knee surgery. Guard Brandon Jenkins is an excellent defender and a good distributor who is an underrated on a national level. He can score and is a surprisingly good rebounder. He broke the fibula in his right leg in August, though, and it is unclear how healthy he will be at the start of the season. If those two players return to their pre-injury form, this team will be very good. Two other starters return in forwards Juan Palacios and Terrence Williams. Palacios has a versatile game and is a match-up problem due to his ability to get to the basket as well as pass and shoot. Williams is extremely athletic but needs to improve his decision-making and shot selection. He could have a huge season after an excellent summer showing on the team's trip to Canada. Terrance Farley is a good shot-blocker off the bench. Freshmen Earl Clark and Derrick Caracter could both start eventually. Clark is versatile and is also very good on the offensive end, while Caracter is talented but has character (sorry, it was too easy) issues. The backcourt will be relatively inexperienced until Jenkins returns. The point guard battle will be between freshman Edgar Sosa and sophomore Andre McGee. Sosa is a playmaker who can drive to the basket and finish, while McGee is a good three-point shooter who can score and distribute. Freshman Jerry Smith is a potentially explosive scorer on the wing. Villanova- The Wildcats will not be as good as last season after the loss of Randy Foye, Kyle Lowry, and Allan Ray, but Jay Wright won't let this team fall off the map. Don't be surprised to see Villanova as a legitimate contender in the Big East Tournament come March, though. The main reason for the optimism despite the loss of the aforemenioned players is the return of Curtis Sumpter. After sitting out last season due to two ACL injuries, he is back and should be ready to go. He is a match-up problem for nearly every defender due to his offensive versatility. He can score both inside and outside and is very difficult to stop on the offensive end. Joining him up front will be Will Sheridan, who was an underrated role player last season. He has a decent mid-range jumpshot and is a very good rebounder and defender. He should increase his numbers this year. Forwards Shane Clark and Dante Cunnigham will also fight for starting jobs. Clark is more of an offensive player, while Cunnigham is an excellent rebounder and a good defender. Freshman Antonio Pena will see minutes at the forward position. The backcourt will be led by returnee Mike Nardi and freshman Scottie Reynolds. Nardi is an excellent three-point shooter who was the forgotten member of the guard quartet last season for the Wildcats. He takes care of the ball and can distribute it well. Reynolds is a former Oklahoma signee who will be a big-time scorer. He can shoot the ball well and also drive to the basket for points. Returnees Dwayne Anderson and Bilal Benn, and freshman Reggie Redding will see minutes on the perimeter. After a positive non-conference campaign last season, in which the Blue Demons went 7-4 and beat teams like California, Creighton, and UAB, they struggled in the Big East en route to a 5-11 conference record. However, with the return of their top 13 players and 99.1% of their total minutes played a year ago, fans can expect more results like the ones they had in the non-conference season. Sammy Mejia is an excellent wing that can do-it-all. He is one of the best shooting guards in the country and contributes in a variety of ways. He is an excellent defender and a very good scorer who can also distribute and rebound. Draelon Burns is one of the best sixth men in the country. He is an excellent scorer who can also rebound decently. The Blue Demons also bring in point guard recruit Will Walker, who will make an immediate impact in the backcourt. He is a very good long-range shooter. On the wing, Karron Clarke is a formidable inside-outside option who makes an impact at both ends of the floor. He is a good shooter who is also a solid rebounder. Jabari Currie and Cliff Clinkscales will also see minutes on the perimeter. Inside, Wilson Chandler leads the way. A prime candidate for a breakout season, Chandler is a very good athlete who can create mismatches with his size and speed. Look for him to increase his production this year. Junior Wesley Green will be the top candidate at the center position. He is a decent producer inside who will be pushed by returnee Lorenzo Thompson. Freshman Thijin Moses will make an impact. Providence- The Friars did not have an overly successful season a year ago, but their disappointing record could have looked vastly different had they not lost eleven games by ten points or less. Heading into this season, things are looking more optimistic. Sharaud Curry is an excellent scoring point guard, and is very difficult to stop at times. Weyinmi Efejuku is a solid scorer and a very good athlete who will need to step up and provide perimeter scoring with the loss of Donnie McGrath. The backcourt will need to develop some depth, but the incoming freshmen will help. Jamal Barney and Brian McKenzie should see minutes off the bench immediately. Up front, the Friars are tough to match-up with. Randall Hanke is one of the most underrated centers in the country. He is very efficient shooting the ball, and is also a solid rebounder and defender. Fellow 6-11 big man Herbert Hill is a nice complement in the middle to Hanke with his scoring and rebounding ability. Both Hill and Hanke are good shot-blockers. Geoff McDermott could have a huge season. He is an unbelievable rebounder from the small forward spot, and is a tough match-up for smaller 3s. Jonathan Kale provides depth on the interior, while Charles Burch gives some added shooting and scoring at the forward spot. St. John's- Although they only won 12 games last season and didn't even make the Big East Tournament, this could be the year coach Norm Roberts takes the next step and gets the Red Storm to the postseason--whether it be the NCAA or NIT. Lamont Hamilton is one of the most underrated big men in the country. The Wooden Award candidate has a chance to become an All-Big East performer if he becomes more agressive and consistent on the interior. Hamilton is a good scorer with a nice face-up game and he is also a very good rebounder. Wing Anthony Mason, Jr. has a lot of potential on the offensive end. He demonstrated some of that potential last season, but needs to become more selfish and defer to his teammates less often. He has a very good mid-range game who has improved his ability to get to the basket. Guards Darryl Hill and Eugene Lawrence are small, tough-minded guards that can create on offense. Hill averaged over 20 points per game two seasons ago but dropped to 12.3 last year after being hampered by a knee injury most of the season. Lawrence is a very good all-around player who can score and shoot the ball and is also a very good rebounder and distributor. Aaron Spears returns as the center. He provides size and defense down low. The incoming newcomers are expected to make an immediate impact. Derwin Kitchen and Avery Patterson add shooting and scoring on the perimeter, while forward Qa'rraan Calhoun could start at some point this season. This team has enough depth and talent to be competitive this season. Notre Dame- The Fighting Irish were known as an unlucky team last season, and ended up going only 6-10 in the Big East. This season, the expectations are not very high for Notre Dame as they lose their best players in guard Chris Quinn, the team's leading scorer, and big man Torin Francis, a double-double threat every night. However, this team could beat some teams it shouldn't this season. Russell Carter and Colin Falls form a very good wing combo. Carter is an excellent athlete who can score inside and outside. He is also a good rebounder and a very good defender. Falls is an outstanding long-range shooter who needs to develop a more well-rounded offensive game if he is to become the go-to-guy. Running the point will be sophomore Kyle McAlarney or freshman Tory Jackson. McAlarney is a very good long-range shooter who can be a prolific scorer, while Jackson is very quick with the abll who likes to get to the basket and make plays. Rob Kurz and Luke Zeller are solid big men down low. Kurz is a decent scorer and rebounder who can step out and shoot the ball. He is also a solid shot-blocker. Zeller will have to increase his production in the paint to replace Francis. Freshman Luke Harangody will also see time on the low block. Notre Dame may be depleted, but I wouldn't overlook this team. After an NCAA Tournament appearance a year ago, the Pirates will take a step back this season with new coach Bobby Gonzalez and the loss of two All-Big East performers in Donald Copeland and Kelly Whitney. However, Gonzalez brings in three very good perimeter players who will make an impact. 6-0 point Eugene Harvey is extremely quick and likes to drive to the basket and finish. 6-3 Larry Davis will provide scoring in the backcourt with his shooting and penetrating abilities. Wing Kashif Pratt will be a defender and rebounder from the perimeter. The best of the returnees is guard Jamar Nutter. He is an excellent scorer who can stroke it from long-range. He will be the go-to-guy for the Pirates. Part-time starter Brian Laing is a good shooter and a solid rebounder who will see plenty of minutes, while Paul Gause is an efficient scorer. Up front, Stan Gaines and Grant Billmeier will start. Gaines is a good defender and a versatile scorer, while Billmeier is a returning starter who is a decent role player. Rutgers- The Scarlet Knights had a very good season last year, finishing with 19 wins and even making it to the second round of the NIT. However, they lost coach Gary Waters and first-round draft pick Quincy Douby, one of the nation?s best scorers a year ago. New coach Fred Hill will not have an empty cupboard, but he will have his work cut out for him. The strength is on the perimeter, in guards Marquis Webb and Anthony Farmer. Webb is the team?s leading returning scorer. He is a solid point producer and a very good defender and a decent rebounder. Farmer returns at the point. He takes care of the ball and distributes it well. He will need to improve his offensive production, though. Rutgers transfer Courtney Nelson will fight for a starting job on the perimeter. He is a good scorer. Up front, J.R. Inman leads the way. He can play a variety of positions and is a versatile scorer. Moreover, he is a solid rebounder. Look for him to create mismatches this season. Big men Byron Joynes and Adrian Hill need to improve their production if the Scarlet Knights are to repeat last season?s performance. Freshman Hamady N?Diaye is a shot-blocker who will see immediate playing time. Ollie Bailey and Jaron Griffin will also fight for minutes. Cincinnati- The Bearcats may have been the biggest snub of last year?s Selection Sunday, getting left out of the NCAA Tournament despite an 8-8 conference record and a better record than Syracuse. However, they lose the most of any team in the Big East and will struggle to make the Big East Tournament. The only key contributor from last season that returns is forward Cedric McGowan. He started every game last season, but will need to improve his offensive production to help replace Eric Hicks and James White. He is a very good rebounder and defender who has scoring potential on the interior. He will be joined down low by JC transfer Hernol Hall. He is going to make an immediate impact down low after earning JC All-American honors a year ago. Also fighting for minutes inside are JC transfers Marcus Sikes and John Williamson. They are good scorers who can do a lot of things at both ends of the floor. They will get a chance to show what they can do right away. Returnees Ronald Allen and Abdul Herrera will get minutes. On the perimeter, Jamual Warren and Deonta Vaughn will be the main scorers. Warren is a playermaker, while Vaughn can distribute and shoot. Tim Crowell is a quick point guard who can pass the ball well. West Virginia- Another team that lost a ton of production from a season ago, the Mountaineers will have to replace NCAA Tournament heroes Mike Gansey and Kevin Pittsnogle, in addition to shooter Jon Herber and Patrick Beilein, not to mention point guard J.D. Collins. Coach John Beilein will field a competitive team though. Returning starter Frank Young will lead the way. The 6-5 forward can do a variety of things at both ends. He is a very good defender and a solid rebounder who can also score if needed. He will become a go-to-guy this season. Returning guard Darris Nichols saw significant minutes off the bench last season, and will move into the starting lineup this year. He takes excellent care of the basketball, but needs to become a better offensive player if he is to become a key scoring option. Wings Alex Ruoff and Joe Alexander will also see increased playing time on the perimeter. Ruoff is a do-it-all type of player, while Alexander is an athlete that could become a match-up problem due to his versatility and size. There are newcomers all over the roster ready to make an impact. Devan Bawinkel and Joe Mazzulla will see time in the backcourt, while Wellington Smith and Da'Sean Butler are fowards who will fight for starting jobs. Down low, Butler transfer Jamie Smalligan will start. He is a decent long-range shooter who is also a good interior player and rebounder. Returnee Rob Summers will back him up. South Florida- This could become an annual saying: the Bulls are projected to be the worst team in the Big East. They went 1-15 last season in their first year in the conference, going only 7-22 overall. They lose their top two scorers in James Holmes and Solomon Jones. The go-to-guys on this year's club will be Melvin Buckley and McHugh Mattis. Buckley is a very good three-point shooter who is a solid rebounder. He needs to develop a more well-rounded offensive game, though. Mattis is a very good rebounder for his size who might be the best 6-6 shot-blocker in the conference. He is also a very efficient inside scorer. LSU transfer Kentrell Gransberry and Arizona transfer Jesus Verdejo will be other key scoring options once they become eligible. Gransberry is a 6-9 big man who is an excellent rebounder and a good shot-blocker and inside scorer. Verdejo is a good long-range shooter who will score from the wing. Valparaiso transfer Aris Williams and senior forward Melvyn Richardson will see minutes in the frontcourt. At the point, redshirt freshman Chris Howard will battle returning starter Chris Capko for the job. Howard will likely start if he is healthy. Freshman Solomon Bozeman will also fight for minutes at the lead guard position.